Smash cake shoots are all the rage for kids’ 1st birthdays. How big are they? They’re almost as much of a ‘must’ as the birthday party itself. While we know everything there is to know about the party and what kind of birthday cake goes best at it, we decided to go to the expert when it comes to photography. Enter Samantha Davis of Happy Hippo Photography. She answered all the burning questions about doing a 1st birthday smash cake shoot that we, and probably you too, wanted to know about this new tradition. 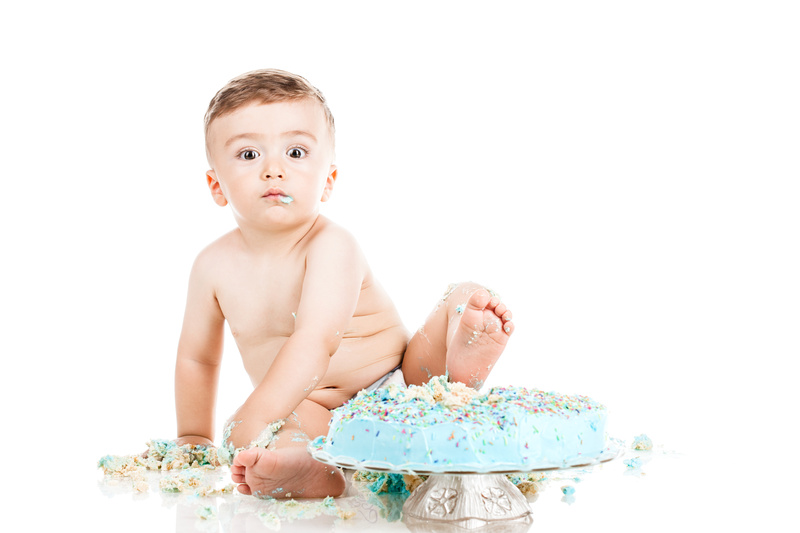 Let’s Throw Something: Why do you think smash cake shoots have become so popular for kids’ 1st birthdays lately? Samantha: I feel like the concept of a “smash cake” has always been popular. And the concept of first birthday pictures has always been pretty popular. It’s just recently that your typical “mall photo session” has decreased in popularity and organic, natural light photographers have really started to become a trend. In fact, when I was in the mall the other day, I saw that JC Penney is now offering “outdoor photo sessions” on certain days and times, likely in an attempt to compete with the new trend. LTS: What’s the key to planning a good smash cake shoot? Samantha: The key to planning a good cake smash session is to keep it simple and not have too many expectations. There is nothing wrong with having ideas, getting crafty, and having an elaborate plan for your child’s first birthday pictures. But from experience, babies have a tendency to not be Pinterest followers and therefore end up playing with dirt, grass, rocks, their toes, and basically anything other than the object they are intended to interact with. Keeping it simple and just expecting your baby to be the sweet and curious toddler they are, will make for a happy baby and lots of smiles and an enjoyable, stress free time for mom and dad! Aside from that, the basics for any successful baby outing: a good nap, a full belly, some favorite toys, and don’t forget wipes for clean up! I also recommend allowing your baby to get familiar with the idea of birthday cake a couple times before the day of the shoot, so that they aren’t upset by it on the day of. Just a couple bites a few days before just to gauge their reaction, so that we can adjust the plan if necessary. LTS: How many birthday outfits do you recommend a parent have for their child for the shoot? Samantha: When it comes to outfits, I usually recommend no more than three. Simply because most babies aren’t a huge fan of being changed, and the key is to keep the kiddo happy for as long as possible. I recommend outfits you can double. For example, you might start with a t-shirt and some shorts, then if you want to switch it up, just grab another shirt that will match the same pair of shorts. When it comes to the actual birthday cake smash, this would be a great time to break out any “themed” outfits you might have! Shirts that say “I’m One!” or fluffy tutu’s for little girls. My personal favorite though, and usually the most popular, is just bottoms (ie bloomers or diaper cover for girls, jean shorts with suspenders for boys) with no top, because they are going to get so messy anyway, and it helps show off the last of the baby belly and sweet baby rolls before they become little toddlers! Also, it’s good to try to keep the location that you are wanting to do your pictures in mind when picking outfits. If you know you’re going to have a white fence in the background, white might not be the best choice. If you know you’re wanting lots of green grass and trees, too much green and too busy of an outfit probably won’t work well. When all else fails, chat with your photographer! I’m sure they will have no problem offering suggestions! LTS: What kind of location is best for a birthday smash cake shoot? Samantha: As far as location goes, it is fully dependent on the child. I prefer places that are low traffic, so as to lessen distractions, and obviously an area where your little one can move around safely. Desert birthday cake smash sessions can be hard on little knees if they are not yet walking. And when it comes to greenery, many babies do not prefer the feel of grass. All of these things can be easily solved with a few blankets, but they are just something to keep in mind when you are thinking of where you’d like to go. I personally prefer areas with simple, open backgrounds. Since little ones can be so unpredictable, and they wiggle and move a ton, making sure that you can still get great shots from any angle is important! Many photographers will also offer studio sessions, and I have previously set up a mini studio type session in clients’ homes, so it really is up to parents as to where they think their little one will be the happiest. LTS: What type of birthday cake makes for the best smash cake? Samantha:A birthday cake can make or break a photo session! If your little one is dressed adorable, and the location is beautiful, and then the birthday cake is too busy or out of theme, it can make photos awkward and off. A small, white or yellow cake with a lightly colored or plain whipped or buttercream frosting is usually going to be what photographs best. Fondant isn’t messy and can be difficult for little hands to break into. Chocolate and chocolate frosting can sometimes look a little unappetizing after it gets all mushed up. Bringing a #1 candle can be helpful too, as many babies aren’t super interested in the actual cake, and often use the candle to play in the cake which creates the same effect. If you’re able, I always recommend finding a local baker to make you a specific “smash cake.” Most bakers will know that this means a smaller cake with a very simple design, with a frosting that will be nice and soft for better effect. If you’re on a budget and cannot afford an actual baker, you can go into almost any grocery store and ask for a small round cake with nothing but simple white buttercream or maybe just a few little designs here and there. Save the big themed cakes (think characters and elaborate drawings) for their birthday party, and just bring something simple and small for pictures. I’ve even had great success with a simple homemade cupcake with a few sprinkles. But simple is key! And also, just to add, feel free to get creative! A “smash cake” doesn’t always have to be a cake! I have had parents do chips and salsa, watermelon, and pie too!